RPL is a method of assessment leading to the award of UKCC teaching aquatics and coaching certificates that considers whether a learner can demonstrate that they can meet the assessment requirements for a unit through knowledge, understanding or skills they already possess and so do not need to develop through a course of learning. ​This process should be seen as an alternative route to achieving a qualification and not a shortcut or cheaper option. RPL enables recognition of achievement from a range of activities using any valid assessment methodology. Provided that the assessment requirements of a given unit or qualification have been met, the use of RPL is acceptable for accrediting a unit, units or a whole qualification. Evidence of learning must be valid and reliable. Identifying what the learner knows and can do; At induction provide guidance to the learner – interview, CV, portfolio, questionnaire, certificates. Matching the learner’s skills, knowledge, and experience to specific standards and the associated assessment criteria of a qualification; Assessor/Centre assesses evidence against standards. Assessing the learner against those standards; Assessor assesses learner via interview, Q/A, exam, oral exam, portfolio detailing relevant experiences and identifying the learning achieved and testimonials from employer/supervisor. Crediting the learner for skills, knowledge and experience built up through formal, informal and non-formal learning that occurred in the past. Centre to credit respective unit, units or whole qualification. Formal learning is that which took place through programmes of study or training delivered by training or education providers and which attracted an award. Non-formal learning is that which took place alongside mainstream systems of training/education. It may be assessed but does not lead to certification. Eg learning and training activities undertaken in the workplace or in community-based learning. Informal learning is that which took place through life and work experience (experiential learning). It is often unintentional learning and may not have been recognised at the time of the experience as contributing to skills, knowledge and competencies. 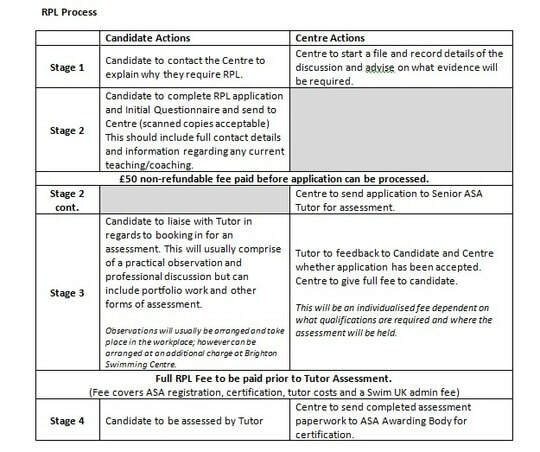 Initial assessment fee: £50.00- compulsory, non-refundable fee to be assessed for consideration of RPL (this does not guarantee that you will be able to go ahead with this option). Awarding of qualification: Dependent on requirements (likely to be at least £400.00 for Level 1 and £750.00 for Level 2 but this could be significantly higher or lower). This will be confirmed for you before attending any sessions/ assessments. To be considered for RPL the completed RPL Initial Questionnaire and any supporting evidence must be received by Swim UK. Phone Swim UK to discuss your personal situation - 01273 434400.